Breitling is one of the brands that doesn’t get a lot of coverage here. Perhaps because they make me think of two tone Crosswind models with those UTC bracelets, but I am aware that this is not entirely fair to this brand from Grenchen, Switzerland. 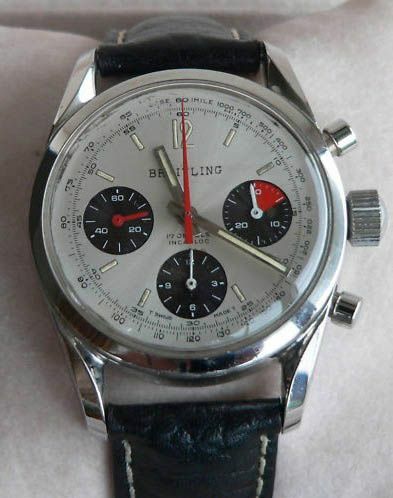 However, I found this vintage Breitling Chronograph from the 1970s with a Valjoux 72 handwound chronograph movement. This movement has also been used by Rolex for their (Oyster) Cosmograph Daytona models from that period. The Breitling has – more or less – the same small dimensions as these 1970s Rolex Daytonas. A 37mm diameter case and 13mm in height. The small and sleek case with the big ‘pilot’ crown for easy winding makes this watch also ‘optically’ an interesting object in my opinion. The white dial also stands out, with its dark registers with red accents. I can imagine wearing this vintage chronograph on a black strap with red stitching for example. The auction started with 1 Euro on the 17th of April and is currently at 436 Euro with two days to go. The nice ‘extra’ about this watch is that the movement is fairly good and easy to service by watchmakers. 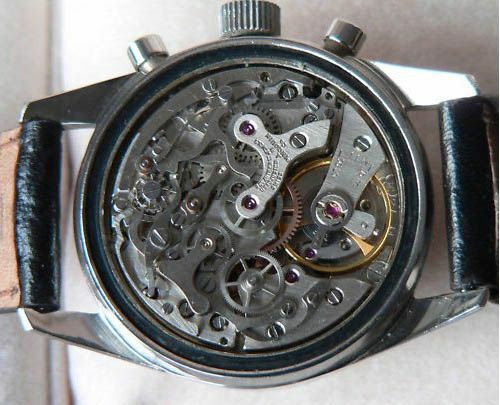 There are a lot of spare parts floating around for these movements and a lot of watchmakers have experience with these vintage Valjoux movements. It shouldn’t therefore cost you an arm and a leg to have it serviced periodically. The movement is signed J.P. Pingouin, which I’d never heard of before, but it appears to be some kind of famous watchmaker from that period. Spending some time on various watch websites, I noticed that his ‘signature’ is on similar Valjoux movements for several other brands as well. You can check out the eBay auction here. It is listed in German and has a short summary in English as well.